"Auto Glass Service uses a urethane adhesive on our OEM (Original Equipment Manufacturer) glass that provides a much shorter SDAT time and adheres to AGSC standards." If you had trouble understanding that, you're not alone. Like most professions, the auto glass industry has its own language. Here's an unofficial guide to the lingo of the auto glass world so you'll be prepared to answer and ask the right questions when you find yourself speaking with a technician or repair company. Adhesive This is the bonding agent that holds replacement auto glass in place on your vehicle. AGRSS If you see this term around, know that it refers to the Auto Glass Replacement Safety Standards council. However, this organization changed its name at the start of 2012 and is now called the Auto Glass Safety Council (AGSC). AGSC Formerly AGRSS, the Auto Glass Safety Council created the national safety standard for auto glass repair and replacement. The standard deals with every part of the repair, from the type of adhesive a technician should use to the training process for every certified technician. You can read the full safety standard here, and I'd recommend it. The more you know, the more informed you'll be when choosing a company for your repairs or replacements! Antenna This is the thin metallic line that sits either between the pieces of glass on your windshield or is attached to the inside of the windshield. If your vehicle has an antenna like this, you will usually not have an external "whip" antenna. Fine Wire Heated These thin metal wires conduct electricity and generate heat to defog and defrost your windshield. If you look closely, you should see them spaced about a half inch apart and running horizontally through your windshield. They are usually located in the black band at the bottom of the windshield under the wipers. Glass Color You may not realize this, but there is no such thing as a completely clear piece of auto glass. Every vehicle's glass is tinted with a particular color, and the most common colors are blue, green or bronze. If you aren't sure what color your auto glass is, just place a piece of white paper behind it and see how it looks from outside your vehicle. Heated This means your windshield is completely heated, not just heated where your windshield wipers rest. Not all vehicles have this feature, so use your VIN number to check if it's included with yours. Heated Wiper Park Area The area of your windshield where your wipers rest needs to be heated to prevent freezing and slush accumulation. They may be visible if you're standing outside the vehicle – look for brownish lines along the bottom 4-6 inches of your windshield. Heads-Up Display Some newer vehicle models have this feature, which projects the instrument panel measurements onto the glass so that the driver can watch the road and check the vehicle's performance at the same time. Laminated Glass When you put a piece of laminate between two pieces of glass, it holds both pieces together even if the glass breaks. Your vehicle's windshield is made of laminated glass. Light Sensor This sensor recognizes a light deficiency and turns your headlights on and off automatically. Not all automobiles have this feature. Mirror Bracket This is the small metal bracket that holds your rear view mirror to the inside of your windshield. Molding This is the finishing strip that hides the unfinished parts of the area your windshield is bonded to. OEM (Original Equipment Manufacturer) This is one of the most important things to look for in your replacement glass. Some repair companies will size a generic windshield to fit your car, which may sound okay in theory, but if the glass isn't made specifically for your model, it will cause you all sorts of problems, and you can read about some of them here (link to other press release). By working with a company like Auto Glass Service that uses OEM (Original Equipment Manufacturer) glass, you know you're getting a product that comes straight from the manufacturer and is made for your exact vehicle. 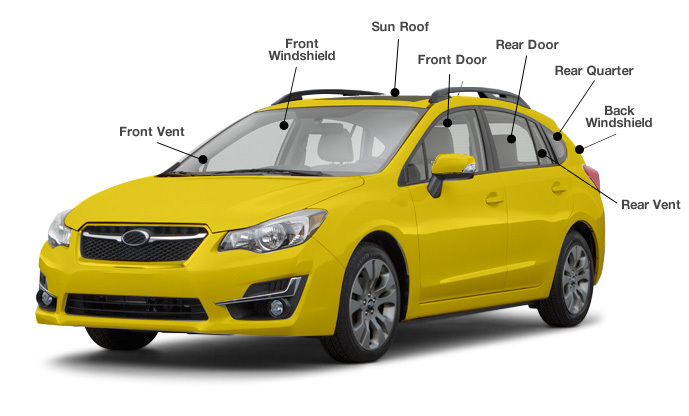 In essence, OEM (Original Equipment Manufacturer) glass is a perfect replica of the windshield your car was made with. If a company tries to sell you on any other type of replacement glass, run! Frit Band Many windshields are outlined with black ceramic paint. This is not the same thing as molding; it's painted around the perimeter of the windshield inside the vehicle. Quarter Glass This small piece of glass is the last piece of glass on either side of your vehicle. Rain Sensor This sensor detects the amount of rain hitting your windshield and automatically adjusts the speed of your windshield wipers. Resin If your auto glass is chipped or cracked, a technician will use this hardener to repair the damage. After it has filled the chip or crack, it is treated with UV light to protect the windshield from any more damage and restore your car's structural integrity. SDAT Safe Drive Away Time. This is the amount of time it takes for your windshield to "heal" after a replacement before it's safe for you to drive it again. Some adhesives have shorter SDATs than others. With some products, it may not be safe to drive your vehicle for an entire day after a replacement, but Auto Glass Service uses a high-quality adhesive called Sika that provides a one-hour SDAT so you can get back to your crazy schedule as soon as possible! Side Glass Also known as door glass, this is found on both the driver and passenger side doors. Solar Coated Some windshields have a coating on the inside that reflects infrared energy. If it's cloudy outside, this coating may make your windshield look blue or purple. Urethane This refers to a specific, strong adhesive that holds your glass to your vehicle's frame. Vent Glass This triangular piece of glass can be located in the front or rear door. Windshield Repair If your windshield isn't damaged badly enough to warrant replacement, the AGSC-certified technicians at Auto Glass Service can repair your glass in under 30 minutes. Repairing minor damage now prevents major damage from happening later, so call Auto Glass Service as soon as you notice the problem. Our process is safe, quick and effective, and we use only the highest quality products to complete all your repairs.